I’ve always wanted to visit Chicago, but just never had a good enough reason to justify flying there from our home state of Texas. 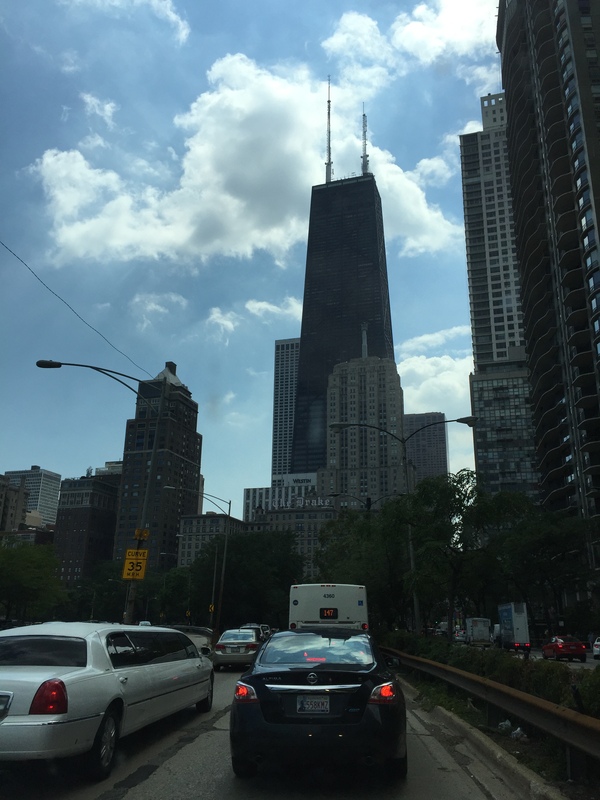 We have been to many great cities in the U.S., and it was inevitable that Chicago would happen eventually. So when I realized that we were just a 4.5-hour drive from Chicago at our current temporary home near my husband’s job, I decided we definitely needed to take a road trip. 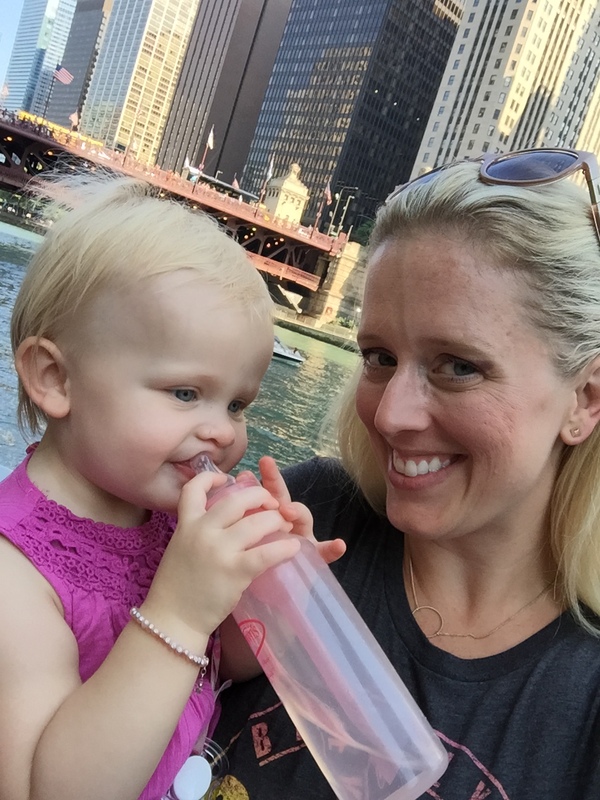 So we loaded up our 4-year-old, Rowdy and our 1-year-old, Romy and headed to The Windy City for a mere 26 hours. We have multiple trips coming up and wanted to keep this one short and sweet. We left town at about 6:30am on Saturday morning, expecting to be in the Chicago area by about lunchtime. Just a week before our trip I had discovered that the Chicago Air and Water Show was taking place on the weekend we would be there. Uh oh. That means more crowds. So when we rolled up to downtown Chicago, I realized that I was 100% right. People, people, everywhere. We sat in traffic for a bit, but luckily I have a sun roof and we were able to see some of the air show above us. After checking in to our hotel, it was time for some Chicago pizza for lunch. When we discovered that Giordano’s had a 35-minute wait, we headed out to find an alternate spot. 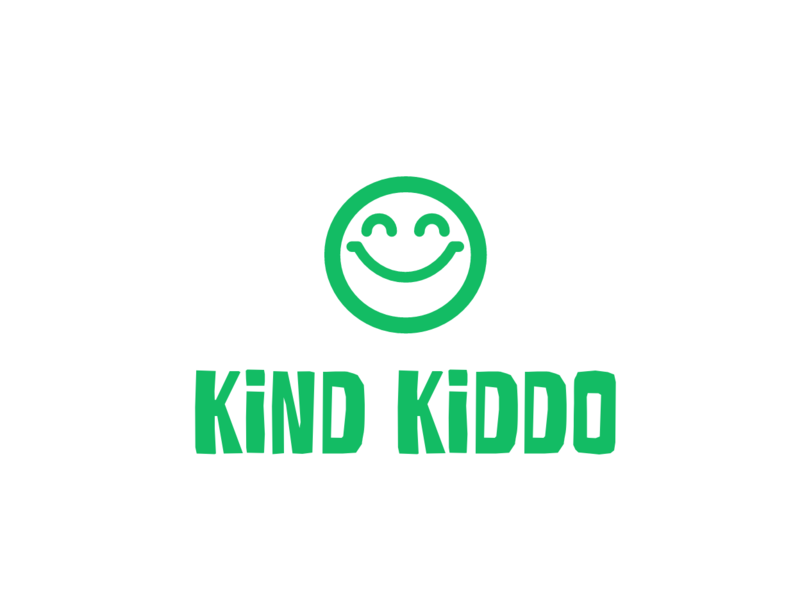 If you have young children and/or babies, you know that a 35-minute wait when your kiddos are hungry and stir-crazy is not good. But we ended up stumbling upon Pizano’s and had some really delicious pizza (and some much needed beer and wine). A lot of these pizza restaurants require 30 minutes to make your pizza fresh. So I can only imagine having to wait 35 minutes at Giordano’s for our table, and then an additional 30 minutes for the pizza to be made. Our kids would have been starving and very grumpy by then. We opted to eat outside, which was super fun for Romy. It was very loud with delivery trucks zooming by, the train passing nearby every few minutes and the plane show happening above. She had a ball. 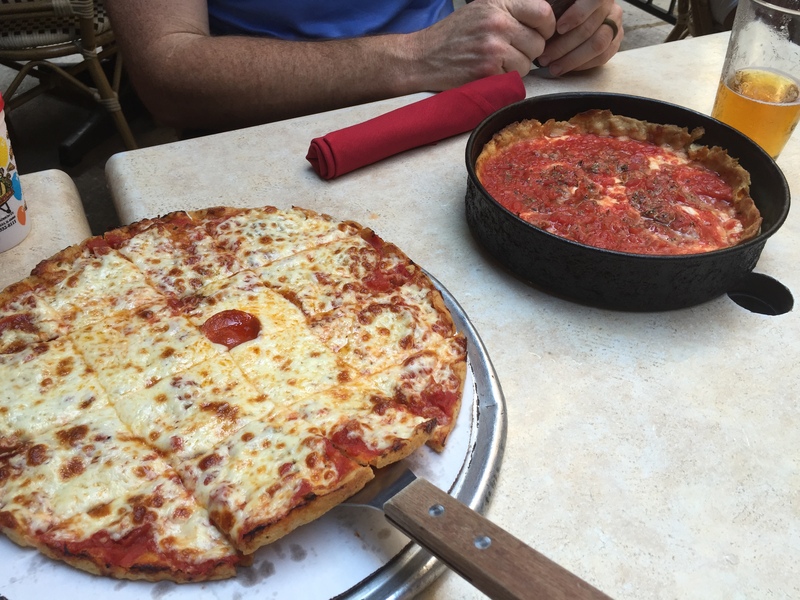 A deep dish and thin crust from Pizano’s, Chicago. 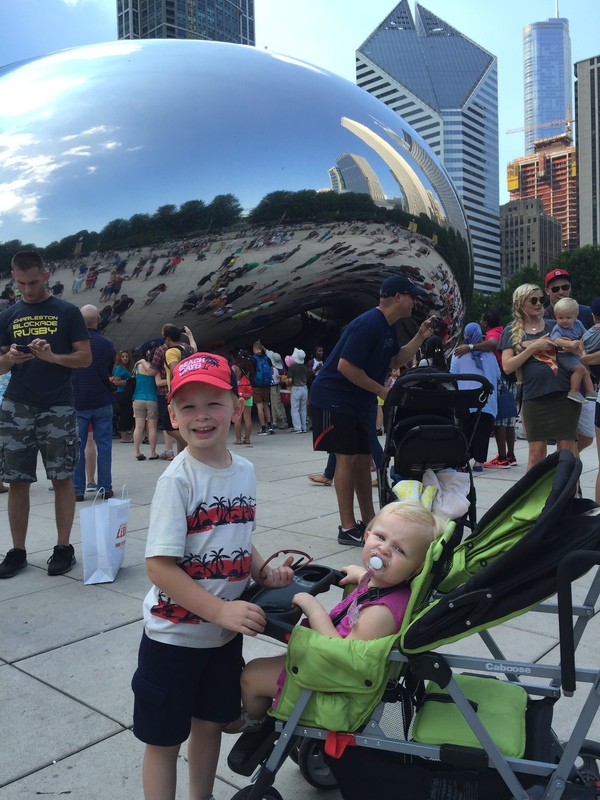 Photo opp with the squeaky stroller at “the bean” in Millennium Park. There was enough time for a detour before our scheduled 4:45pm boat tour, so we headed over to Millennium Park for some selfies in front of “the bean”. There were tourists, galore on the streets everywhere, and the same goes for “the bean”. But we scooted our way in and got a few good shots. The entire park was really nice and very well kept. There were some cool photos on display of Chicago that we checked out as we were leaving. 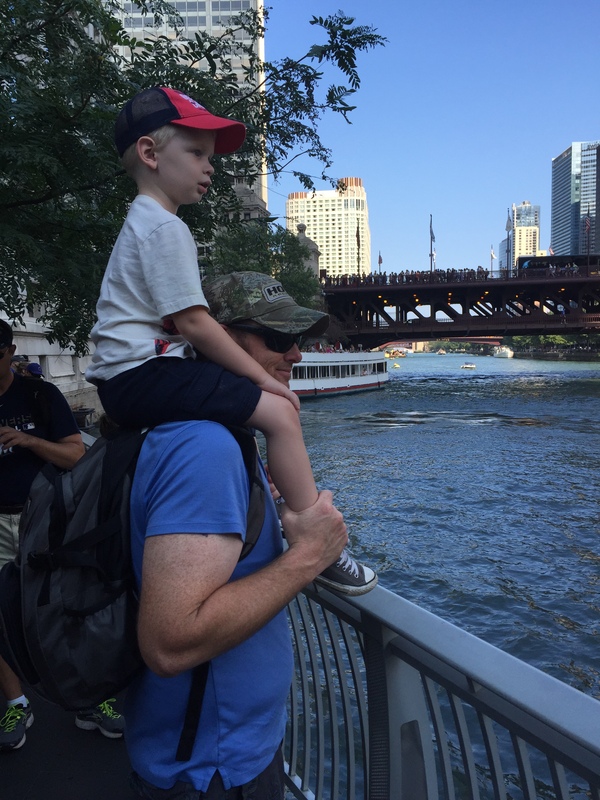 Now that we had checked pizza and Millennium Park off of our to-do list, it was time to walk over to the Trump Tower dock for our boat tour. Let me just add a little side note that our stroller, as handy as it is for a baby and a preschooler to ride at the same time, has an issue and was squeaking pretty much constantly. And it was loud. Like, loud. Can you imagine? It was so funny and so embarrassing at the same time. Good thing we were around a bunch of strangers that we would never see again. I opted to buy tickets ahead of time online and chose Wendella’s 45-minute river experience tour. It was described as casual and family-friendly. Perfect. Although the kiddos were getting gradually whinier, snacks, drinks and a boat ride definitely helped. I mean, they weren’t as impressed with the tour as we were. Rowdy kept asking to go back to the hotel and Romy, well, she’s a baby. We could have been on a paddle boat in a small pond and she would have reacted the same as she did to this big boat in the Chicago River surrounded by skyscrapers. Between our kiddos and the young, European tourists seated behind us, I only heard about 50% of what the dude said. But what I heard was very interesting, and the buildings are beautiful. Plus, they have a bar on board, so that’s always a plus. After the tour, instead of leisurely strolling back to our nearby hotel to eat and relax for the evening, we decided to scoot on over to Navy Pier. We didn’t have a particular plan, but just knew it would be a good Chicago landmark to check off of our list as well. So after q quick stop at the new Ghiradelli store and then confusing ourselves by going to the wrong street level and ending up in Whole Foods (not a bad place to end up), we finally made it to Navy Pier, squeaky stroller and all. It was big and crowded with some chain restaurants, a ferris wheel and boat rides. I’m sure that kids could have a ball there for hours, but we didn’t feel obligated to stay long. Rowdy was still concerned with returning to the hotel and Romy fell asleep in the stroller. And that was our visit to Navy Pier. It was finally time to head back to the hotel and get these kiddos fed and ready for bed. Luckily, I still had a sandwich and some snacks that I had packed for them. So that was their dinner, which they were totally cool with. As for Ryan and me, well, we were so pooped and hungry that Ryan simply went to Chipotle nearby and got us some burritos. I typically don’t like to eat at a restaurant on vacation that I could easily eat at near home, but in this case, we just needed food and bed. And that’s what we got. Between 1pm and 7pm on Day 1, we managed to eat some Chicago pizza, visit Millennium Park, take a Chicago River boat tour and check out Navy Pier. Not too shabby for a measly 6 hours in a big city with 2 kiddos under 5. And now that Day 2 was upon us, we got going pretty quickly so we could have some breakfast and then head to the museum. The Museum of Science and Industry was our only major plan for Day 2. Our initial motivation for going was their Robot Revolution exhibit because Rowdy is pretty much obsessed with robots right now. We ended up having breakfast at McDonald’s after discovering there would be a long wait at a local cafe. I can handle crowds if needed, but I very much dislike waiting for food. And as previously mentioned, young children dislike it even more. I barely ever eat at McDonald’s, so it was kind of a novelty to do it on a family trip just like my family would often do on road trips. No biggie. Tasted fine and filled our bellies. We finally made it to our final Chicago destination, The Museum of Science and Industry. And even though this was our only plan for Day 2, we had to move somewhat swiftly considering that we still had a 5-hour road trip ahead of us to get back home. We saw farming equipment, a huge locomotive, an airplane, a submarine, a tornado and finally, the robots. First of all, the entire museum was amazing. The building is gorgeous, the exhibits are fantastic and everything was clean and organized. We could have spent all day in there if we had the time. Robot Revolution was great for Rowdy. 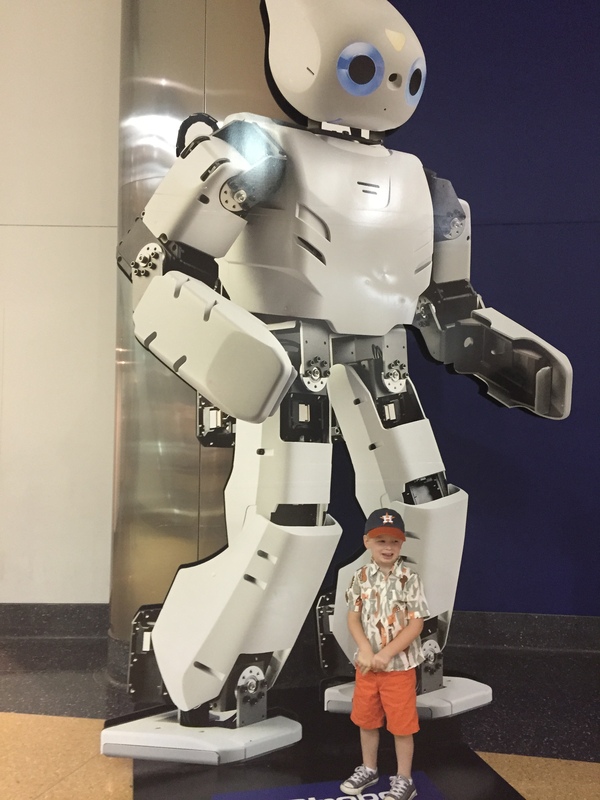 He got to see different types of robots up close and even interact with some. That kid was in heaven, and even more so when we walked into the “robot store” as he called it. So of course we bought a couple of things from the gift shop before we left. Rowdy was excited about Robot Revolution at The Museum of Science & Industry. 1. Parking is expensive. Most hotels downtown charge at least $50 per night for parking. The museum charged $22 for parking. 2. If you go on a weekend in the summer, it’s going to be crowded. Make restaurant reservations or show up early to casual places to beat the crowds. Bringing sack lunch materials, at least for the kiddos, is super helpful. 3. If Giordano’s is too crowded, or if you want something a little less “touristy”, go to Pizano’s. It was delish and right in the middle of the downtown action. 4. Wear your walking shoes. Because I knew that parking everywhere was going to be expensive, I made the decision to pay for our hotel parking, but walk everywhere else in order to avoid multiple parking charges. Even with 2 little ones and a super squeaky stroller, we managed to walk everywhere on Day 1. 5. Chicago is a big city with lots to see and do. I would recommend being there for more than 26 hours. A quick trip was what we needed this time, but Ryan and I definitely want to go back someday for some more exploring….and food. That was a great trip and a great story.